If only all 30th anniversary parties could be as much fun as Space Invaders Extreme. Space Invaders are back, celebrating their 30th anniversary with Space Invaders Extreme for DS. Taito opted to give this formula a new twist, rather than simply repackaging it. As a result, it's a much fresher experience than previous incarnations. You still fly through waves of alien invaders, shooting them before they attempt to take over Earth and turn everyone into mindless slaves. However, instead of slowly hovering across the screen, they fly in a number of funky formations and in multiple colors, which play a huge role in the game. If you shoot three or more enemies in a row that are the same shade of red or blue, you acquire a helpful power-up that lets you clear the screen even quicker, such as a laser cannon or explosive shots. You can also earn bonus points for accuracy or speed, giving the original formula a much-needed strategy boost. It's loads of fun, even though the game doesn't specifically make use of the DS touch-screen. UFOs also play a huge part in Space Invaders. They'll fly across the top and bottom, offering extra points when blasted. There are some new glowing ones, and killing one warps you to an interesting bonus stage where you have to meet a specific goal before time runs out, such as wiping out a group of enemies or hitting a required number of targets. Finally, the boss encounters are cool, with easily exploitable weak spots and plenty of formations to figure out. There are only two complaints with single-player mode. First, it's too short, with roughly six stages. Second, there's no sign of the original Space Invaders game. Oh well, there's always Space Invaders Revolution, which you can probably find on the cheap. Still, there's replay value in both online leaderboards and multiplayer. You can hook up with a friend in Download Play and battle them for invader-blasting superiority in two-player mode. You have to down all the aliens on your screen before your friend does, and you can pass off invaders and other obstacles between each other. In addition, the leaderboards, updated via Wi-Fi Connection, let you know just how well you're doing against the invader-killing elite. 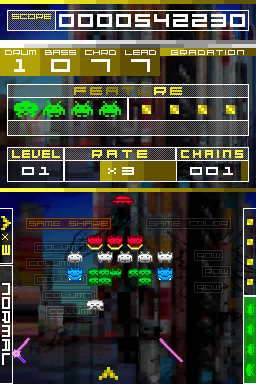 Space Invaders Extreme should be the next game you buy for your DS. It's a nice bump-up from the usual anniversary celebrations, ringing in the new rather than dwelling on the old. Its $19.99 price means you have no excuse. What's Hot: Dirt cheap at $20, new gameplay strategies make Space Invaders that much more addictive to play, multiplayer fun with one cartridge, great presentation. What's Not: Single-player mode is too short, no sign of the original.